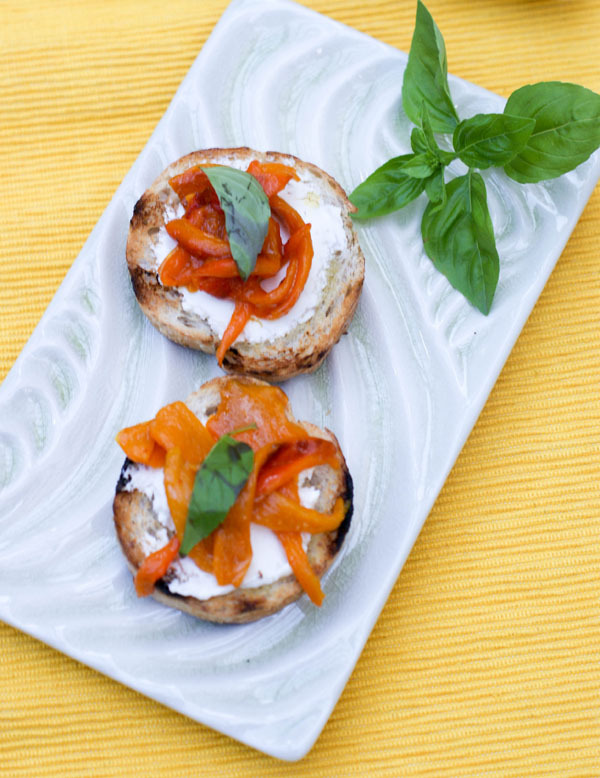 Cream cheese and grilled peppers crostini: easy, quick, fresh and delectable, perfect appetizer for your summer BBQ parties. Hello guys! We’ve been pretty busy lately, with the road trip then back home catching up on housework, regular work, blog work, pictures editing, cats’s care and planning on catering a beautiful Zen Event tonight for our dear friend Jane. So I hope you won’t be too disappointed if this recipe is just something easy, quick and fresh, but delectable all the same. I promise more baking in the next little while 🙂 . 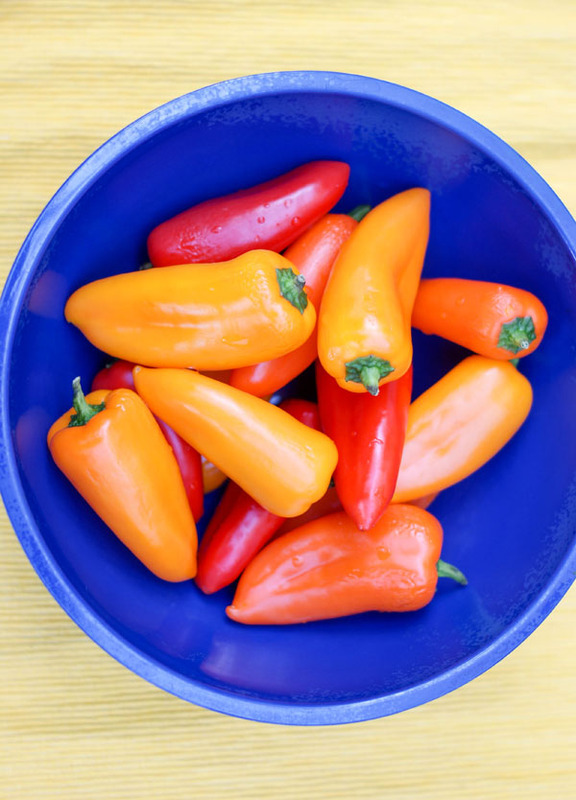 The sweet mini peppers from B.C. had such a great look and promised an even better flavour, we thought that grilling them would be their best use. Loreto bought a nice whole wheat baguette, we had some wonderful organic cream cheese leftover from the cheesecake (by the way, this cream cheese is the best I had so far! ), so the recipe developed pretty much by itself: Crostini with cream cheese and grilled peppers. Our backyard has an explosion of herbs right now, so we are not short of basil (one of our next recipes is going to be a homemade pesto) which is such a great addition to the flavors. Washing the peppers and slicing the baguette won’t take you more than 5 minutes. The only “time consuming” part is grilling the peppers on the bbq (I left that to Loreto 😉 ) but you can also grill them in the oven like I usually do when I’m in Rome, and taking the skin off. You have to do that when they’re still kind of hot, so have some cold water close to your fingers to cool them down. I guess you can leave the skin on, if you don’t mind it. I do. Wrapping them in plastic for a few minutes helps release the skin easier. Then you are going to julienne them, dress them in salt, pepper, minced garlic, extra virgin olive oil and that’s it. Your crostini, appetizer, side dish, main dish, snack, whatever you want it to be, are ready. It was fast and painless, wasn’t it? 🙂 And don’t forget to let your creativity flow when arranging the crostini. The leftover grilled peppers are good for a few days stored in the fridge in a tupperware. We use them in salads, on pizza, as a side dish. Wash peppers, leaving them whole. Preheat the barbecue to 400° F.
Cook the peppers on the bbq for about 10 minutes, turning them frequently. When they’re done and have nice char marks on them, place them in a ziplock bag (or plastic wrap) and let them sit there for about 3 minutes. This helps release the skin from the flesh of the peppers. Once they’re all skinned and have their seeds removed, julienne them and dress with extra virgin olive oil, garlic minced, salt and pepper to taste. Set aside. 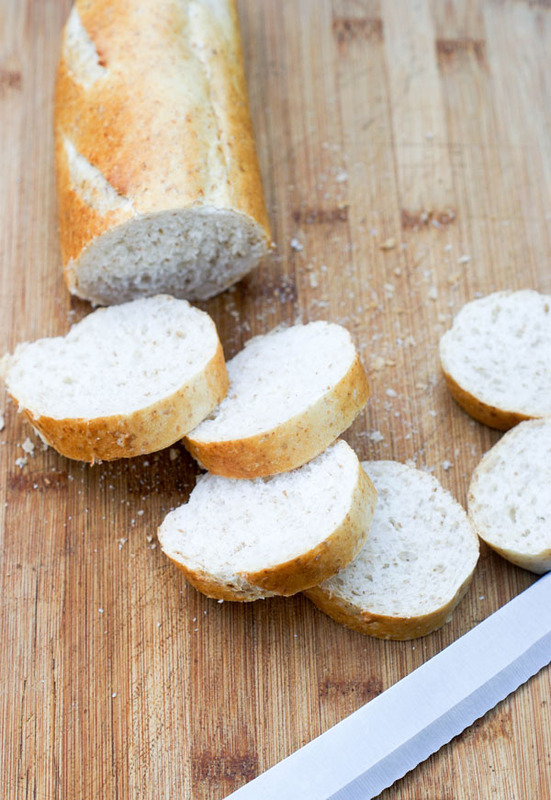 Slice the baguette bread. Spray or brush with 1 tablespoon extra virgin olive oil. Place it on the barbecue and toast it for 1 minute a side. Spread cream cheese over sliced toasted bread. Arrange peppers on top. Decorate with some minced basil leaves. Disclosure: All links in our posts are NOT affiliate links. They are only about products or places we normally purchase and like. Glad you guys had a wonderful trip! Love any kind of crostini and this recipe is perfect and so easy. Great app to pull together quickly when friends come over 🙂 (and I can eat the leftovers for lunch the next day). You got that right, Karrie 🙂 . And it’s always nice to read your comments 😉 . Grilled sweet mini peppers and cream cheese on a sliced whole wheat baguette bread. So simple, so good.